This past Sunday it was fend for yourself night since my Husband didn’t want any dinner. I made the mistake of making him bacon, eggs and toast for breakfast and it filled him all day. Yah, I know what your thinking, how can he not be hungry? The thing I didn’t tell you is how much he ate. The man ate 1 pound of bacon, 4 eggs over easy and 5 pieces of toast. I don’t know where he stores it! I don’t know how someone can consume that much food at once. Crazy!! But since he wasn’t hungry I made one of my favorite sandwiches of all times. 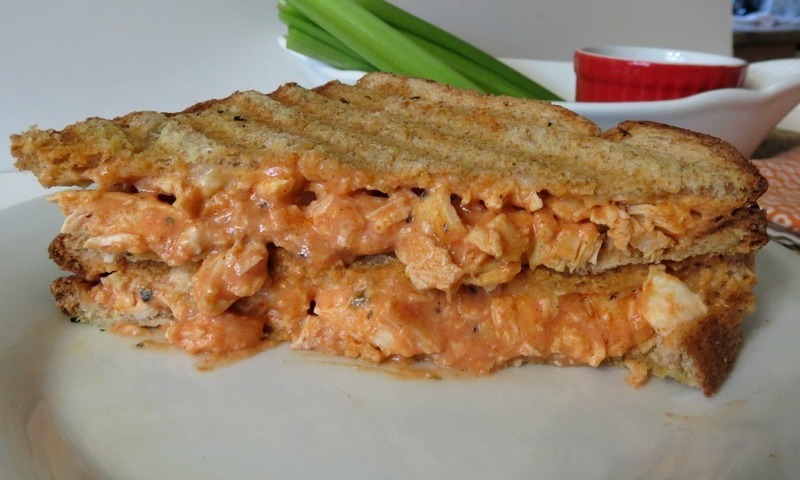 The Buffalo Chicken Panini. Yummy!! Oh baby this sandwich is delicious! It’s spicy, cheesy and just oozing with flavor. I simply love it!!! I have to apologize for the photos. The lighting was not great and honestly I was hungry and I just wanted to eat my sandwich! I kind of LOVE sandwiches. Maybe too much!!! 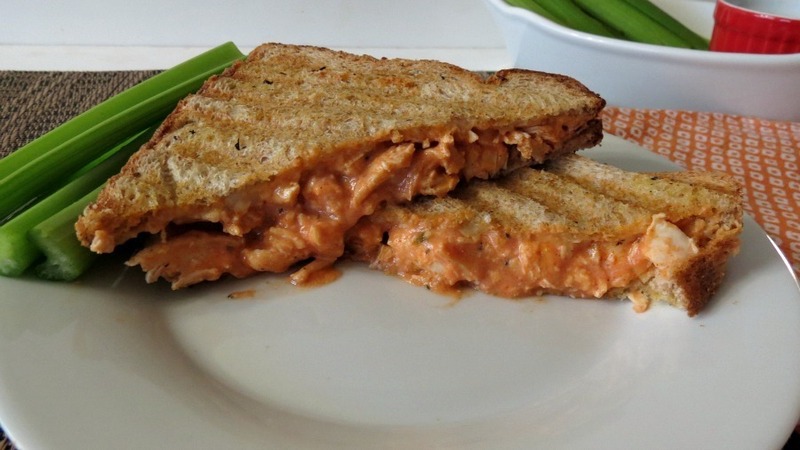 This sandwich is pretty easy to make too! I had some already grilled chicken from Trader Joe’s, added some Franks Hot Sauce, a pinch of mayo and a pinch of Ranch dressing seasoning, mix it all together and you got Buffalo Chicken heaven!! When I was at Target this weekend I saw that Sargento now has Ultra Thin Pepper Jack Cheese and is only 40 calories for a nice size slice. I was pretty stoked since Pepper Jack is my favorite cheese. I added a slice of cheese to my sandwich. For the bread, I used Sara Lee’s 100% whole grain bread and that is only 45 calories a slice. What is nice, is my Husband who hates wheat bread likes this one, so now I’ll never waste a loaf of bread again. Let me tell ya, I don’t think I could have made this sandwich any healthier, not to mention it was delicious! It was hard to contain myself to one sandwich! 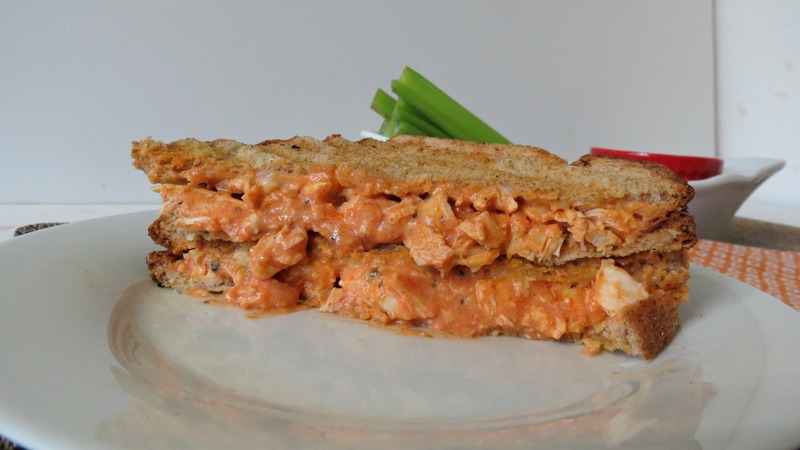 A cheesy grilled sandwich filled with chicken and a hot sauce mixture that tastes just like a spicy buffalo chicken wing. In a bowl add chicken, hot sauce, mayonnaise, ranch seasonings and mix until combined. 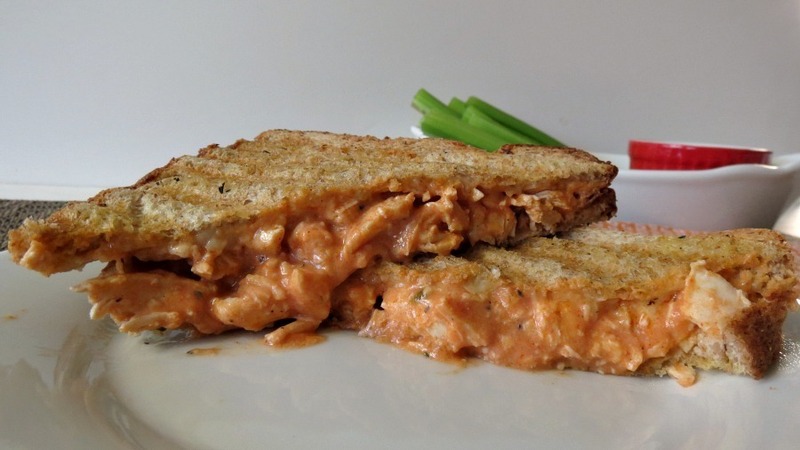 Place chicken mixture on top of bread and top with cheese and the other slice of bread. Place in a panini maker and spray with butter or you can grill the sandwich, by melting 1 tablespoon of butter on a skillet over medium heat. Add the sandwich to the skillet and cook until the bottom is lightly golden then flip the sandwich, can cook until cheese is melted and bread is lightly golden. I have to tell you, I finally saw the movie Julie and Julia. What a fantastic movie! I can’t believe it has been out since 2009 and I am just watching it now. Meryl Streep was amazing as Julia Child. I didn’t know much about Julia Child but now I can see why she is such a legend. She is such an inspiration to all cooks. If you haven’t seen the movie I highly recommend it if your a food blogger or love to cook. I picked it up on Amazon for $5.00. I just was going to hyper link it to Amazon and it looks like they raised the price to $7.79. Still well worth it. Well my Friends time to go! The thing for me is that even if I ate such a HUGE breakfast….I would probably still feel compelled to eat lunch and dinner! At least your husband can self-moderate. This panini looks awesome. Love all that spice! YUM! 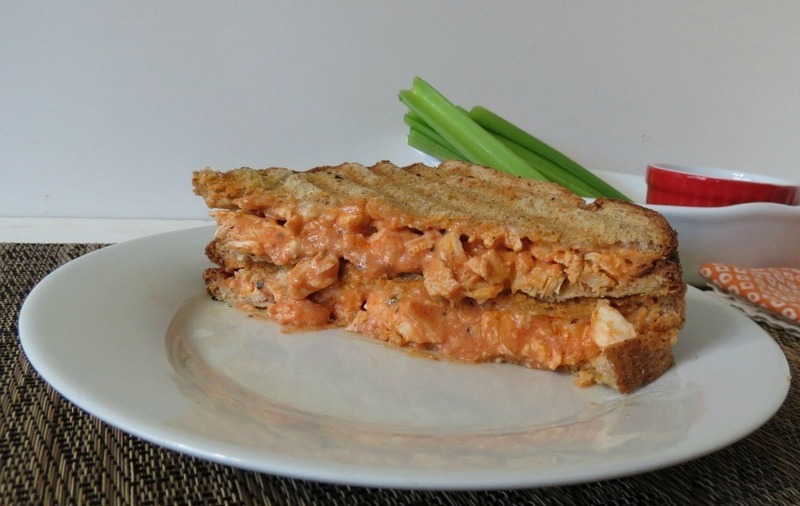 I love buffalo chicken anything, and paninis are the best! Sooo I will for sure be making this soon!! You already klnow me and my Buffalo Chicken! I think I could eat it every day! Anything Buffalo is popular in my home. This looks great!! Pinning! I love hot sauce and hot wings and oh my this sandwich looks delicious! I will have to add this to the dinner menu for next week! I too LOVE hot sauce! I think I could put it on almost anything!!! Mmmmm, I haven’t had a good chicken wing in forever and I miss them, nothing compares to the ones I had when I lived in Buffalo! I could eat a sandwich for every meal (and I almost do!) This looks so good! And I love all the cheese! Thank you for sharing such a delicious and easy recipe. I can’t wait to give it a try. I hope you are having a beautiful day! Me too!! I am a sandwich freak! I just love them! You have a beautiful day too and a super awesome weekend! I’m hosting a recipe link up party on my blog and would be thrilled if you decided to participate!!! Thanks Elena! I’m going to hop on over! This is why I follow you- you and I are food twins! I posted something similar for Thanksgiving turkey leftovers. So good! Btw, I’m making your lentil salad for dinner tonight! Ugh I hate “fend for yourself days” when I have a nice dinner planned only to hear “I’m not hungry” from my husband! But this sandwich looks super yummy.